​Do What You Like Business Strategy™: However, “What you like” is easily misunderstood. It does not imply a lazy, careless, haphazard attitude, but a determination to identify what you like, and to identify it very clearly. So ask yourself: Who and what DO I like? What attracts me? What thoughtful choices have I made over the years about my likes and dislikes? What would I like to amend? Then get ready to enjoy the “Do What You Like” Business Strategy. ​Perfection Workbook™: Accepting Limitations To be perfectly human means we cannot be perfect. Improvement is always possible, so setting ourselves perfection as a goal is painfully unrealistic and can be psychologically damaging. Self Acceptance is a mark of human wholeness. To be perfectly human means accepting ‘imperfection’. ​Purchase Preference Checklist™: To decide what you want to buy. You need to use this checklist to encourage your clients write their own lists to understand their buying preferences. It will help you convey what yo​u've got to sell and how you do it and who you are in the middle of the process. ​Relationship Repair Kit™: All of us get damaged by others in life. We are human beings who make mistakes and we have the potential to damage others too. Of the billions of people in this world, most have been damaged at some time or another, some very seriously indeed, others less so. ​Words That Work Worksheet™: So how can you make your words more effective, more useful, more influential? How can you make your words ‘work’ better, rather than merely adding to the incessant flow? By choosing to speak more carefully when it matters - choosing WHAT you say, and HOW you say it, and to WHOM. 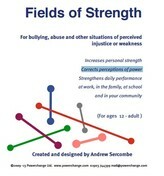 ​Fields of Strength Worksheet™​: This coaching is best in cases where you are facing any sort of bullying or abuse, or other situations of perceived injustice or weakness. You will increase your personal strength, corrects perceptions of power, and strengthen daily performance at work, in the family, at school, and in your community. ​The SHAPE You Are In Worksheet™: This relaxing programme is designed to honour you, your life, your aspirations, your longings and your power. The SHAPE programme is the opposite of ‘try harder.' We are here to help. ​The Powerchange Experience Worksheets™: The Powerchange Experience will lead you into a whole new world, a world of rich, empowering, self-discovery. You’ll be surprised mildly shocked, even. And you’ll learn just how valuable you are. Your mind is a living, growing, unstoppable generator. ​The Ring Series Worksheets™: The 12-stage coaching system we use to coach our clients. It is a brilliant way to get the results the client needs quickly and effectively. The Ring guarantees change for your client. It is simply not possible to complete The Ring and not be a different Learn more..
​The Powerchange Course Worksheets™: The Powerchange Course is a ten-session personal development programme. We will coach you without pressure, and help you take a fresh look at you life, rethink your choices, and get more rewarding results. We’ve filled each 2-hour unit of The Powerchange Course with good things that have the potential to help you make your life more like you want it to be satisfying.